On a glorious summer like afternoon, with nearly a cloud in the sky, the 2017 Homecoming was celebrated in the tiny frame church on the edge of what was once called “Dutch Roost”. The organ is now silent again and the bell is quite. The song books have been put away, the Bible and Altar cover likewise are put away for safe keeping. The building swept and all returned to its rightful place. The doors are locked for another year as the Homecoming for 2017 has passed. For those of you who took the opportunity to join us were given a glimpse at what perhaps a Worship Service might have looked like over 150 years ago! We, the decedents of the St. Peter’s Evangelical Lutheran Congregation thank those who have joined us and shared in our celebration. We also thank those who have so generously join us in partnership in preserving this iconic part of our areas local history. 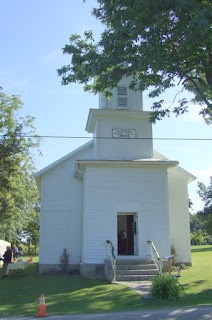 For those of you who have often driven by the old church and cemetery and have been curious, we are the last of the old timber cut log churches that once frequently dotted the Darke County landscape. Our story is not unique. But rather is sadly a commentary of our time. In 1905 German speaking congregations in rural areas dwindled as the young wanted to blend into their new country. English was preferred over German. Location in larger villages and towns also became more important. The activities of the church also changed. Today much has changed, yet much remains the same, as many more churches close for various reasons from lack of attendance or the difficulty in finding Clergy. It is a sad trend. St. Peter’s, listed on the National Register of Historic Places has survived as a witness to the past and we feel needs to continue that mission forward for those to come. If you would like to help preserve St. Peter’s heritage and grounds you may do so by sending a check for any amount to “St. Peter’s Evangelical Lutheran Church Preservation Fund” c/o Jim Kelch, 105 Greenhaven Drive Greenville, Ohio 45331. St. Peter’s is a 501c3 charity and your gift is tax deductable. We appreciate the community’s generosity in keeping the doors open annually as this part of our history lives on. If you are interested in learning more about St. Peter’s Evangelical Lutheran you may visit the Versailles Area Museum where several artifacts from the church are on display. You may also like to purchase a copy of the brief history of the church by contacting Richard Shumaker at 5958 Children’s Home Bradford Road, Greenville, Ohio 45331 for a $12.00 donation and the booklet can be mailed to your home or a friends. On behalf of all our Trustees, thank-you!